The seventh FedEx Cup Playoffs begin tomorrow at The Barclays at Ridgewood CC – the site of dramatic playoffs between Vijay & Sergio in 2008 and Matt Kuchar & Martin Laird in 2010. This year it hosts Rory McIlroy’s charge for a fourth straight victory and his first FedEx Cup title. Rory enters the Playoffs sitting first overall in points and is obviously best positioned to take home the trophy, but it’s much more likely the FedEx Cup goes to someone else. In five years under this format the Cup has gone to the favorite entering the Playoffs only once (Tiger in 2009) and has gone to the winner of the Tour Championship in four of five years. This year, I estimate around a 40% chance of a player winning the FedEx Cup without winning the Tour Championship (about half of Rory’s wins will come in this fashion). 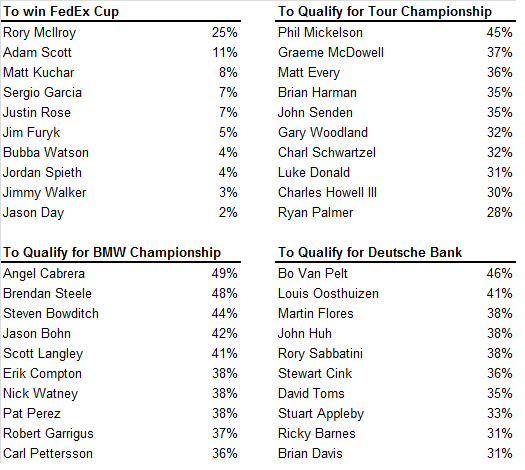 Below are projections for the four main accomplishments – winning the FedEx Cup, making the Tour Championship (top 30), making the BMW Championship (top 70), and making the Deutsche Bank (top 100). I’ve listed the top ten most likely to win the FedEx Cup and then the ten bubble players to earn spots in each event. No surprise that Rory is significantly in front as he’s #1 in the the standings and the best in the world. The rest of the top five is straight-forward as well; Sergio, Rose, Scott, and Kuchar are the next four best players and in the FedEx Cup being very good at golf gives you a slightly better chance to win than having a bunch of points built up. That’s why Jimmy Walker (#2) is less likely to win it. However, further down the list Jason Day (#34) is the 10th most likely to win it, despite missing months of the season with a thumb injury. Besides that, Phil will need a good run to make his eighth straight Tour Championship.